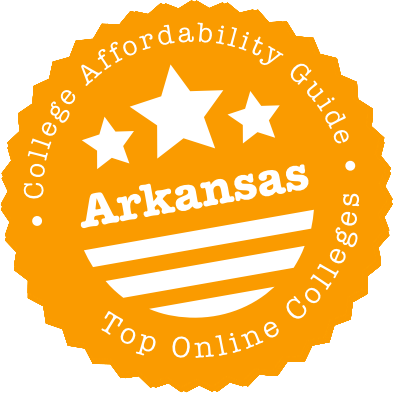 Scroll down to see the top not-for-profit colleges and universities in Arkansas offering online degree programs. Arkansas State University has one of the oldest online degree programs in the state. Bachelor of Arts degrees are offered in communication studies, criminology, political science, and sociology. Graduates of A-State's political science program have a 100 percent law school placement rate. The university offers Associate of Applied Science (AAS), Bachelor of Science (BS) and Master of Science (MS) degrees in disaster preparedness and emergency management. The graduate level courses for this program are available in six modules (two courses each), and students can begin the program with any module. The College of Nursing and Health Professions offers Bachelor of Science (BSN) and Doctor of Nursing Practice (DNP) degrees. DNP students are required to attend an on-campus immersion experience each semester. A Bachelor of Science in Interdisciplinary Studies (BSIS) and a Bachelor in General Studies (BGS) round out the university's undergraduate online offerings. On the graduate level, Master of Science in Education (MSE) and graduate certificates are available in curriculum and instruction, educational leadership, and special education. An online Education Specialist (EdS) program is also offered for educational leadership only. A-State's MBA program offers a concentration in Supply Chain Management. There is also a Master of Public Administration (MPA) program available online. UALR offers more than 450 courses and currently 10 degree programs that can be pursued entirely online. Bachelor of Arts (B.A.) degrees are available in interdisciplinary studies, speech communication, and criminal justice. Required courses for the B.A. in Speech Communication degree are offered in an accelerated 8-week format. Only Spanish and American Sign Language are available online at the current time. There are two Bachelor of Business Administration (B.B.A.) degrees available - B.B.A. in Management and B.B.A. in Human Resources Management. Both programs follow the traditional 17-week format of delivery. UALR also offers a Bachelor of Science in Nursing (RN to BSN) program in 12-month or 18-month cycles that allow students to continue with full-time or part-time employment. There is also a Bachelor of Applied Science (B.A.S.) available. Students interested in pursuing a Master of Education (M.Ed.) degree online can choose either the M.Ed. in Learning Systems Technology or M.Ed. in Reading. The latter offers areas of concentration: reading, literacy and culture, intervention, and dyslexia. The Master of Science in Criminal Justice is an accelerated online program delivered in 8-week terms. Students can expect to complete the program in two years if they attend six terms each year. There are four online undergraduate degrees offered by the University of Arkansas: B.A. in Interdisciplinary Studies, B.S.B.A. in General Business, B.S. in Human Resource and Workforce Development Education, and B.S. in Nursing (RN to BSN completion program). The nursing program follows an asynchronous delivery format and full-time or part-time enrollment options. The university offers Master of Science (MS) degrees in the following areas: operations management, nursing, human environmental sciences, engineering, electrical engineering, food safety, and agricultural and extension education. The MSN program offers a Nurse Educator concentration. Master of Education (MEd) and Doctor of Education (EdD) degrees are available in adult and lifelong learning, educational leadership, and human resource and workforce development. MEd degrees (only) are offered in special education, educational technology, and physical education. Coursework for the Executive MBA program is available primarily online, with on-campus sessions one Saturday each month. MA in Secondary Mathematics and Doctor of Nursing Practice programs are also offered online. The university offers Additional Licensure Plan programs in building level administrator and special education, as well as several graduate certificate programs, including bioenergy and sustainable technology, autism spectrum disorders, and business analytics. Online students only pay in-state tuition and any related distance education fees. The online Professional Studies - Accelerated Degree program at Arkansas Tech University is designed as a degree-completion program for students with associate degrees or professional certifications. Concentrations are available in fields such as applied leadership, business, criminal justice, early childhood education, and public relations. The RN to BSN program offers all required courses online, however, students must attend an on-campus orientation session one week before the first semester starts. There is also an online Bachelor of Science (BS) in Emergency Management and Administration program available. On the graduate level, Master of Science (MS) programs are offered in college student personnel, health informatics, and emergency management and homeland security. The university also offers Master of Arts (MA) in TESOL (Teaching English to Speakers of Other Languages) and Master of Education (MEd) in Educational Leadership programs. There is currently one Education Specialist (EdS) program available online in the field of educational leadership. Associate of Science in Early Childhood Education and Associate of Arts in General Studies degrees are also available. The university offers a number of certificates under the Ed2Go program. Students can choose from courses in a variety of fields, including accounting and finance, design and composition, computer applications, and technology. Northwest Arkansas Community College has three transfer degrees available online, including an accelerated Associate of Arts program that ensures students earn their degree in two years. The accelerated program uses a cohort format (you advance through the program with the same group of people) and schedules two online classes at a time. The classes run for eight weeks. The program is designed for people who have a full-time job or other responsibilities, allowing them to complete a large number of credits but only have to concentrate on two courses at a time. The college also offers online transfer degrees with a traditional format. Five Associate of Applied Business Management degrees are all online except for an internship class. The following undergraduate programs are offered completely online at the University of Central Arkansas: Bachelor of Science (BS) in Professional Studies - Health and Safety, RN to BSN, and Bachelor of Business Administration (BBA) in General Business. Students admitted to the university's Master of Business Administration (MBA) program can choose from concentration areas such as finance, health care administration, information management, and international business specialization. Students can begin the program at any time (fall, spring or summer terms). Master of Science (MS) degrees are available in community and economic development as well as in health sciences. The university also offers a Master of Geographic Information Systems (MGIS) degree online. Full-time graduate students in a health education degree program (such as MS in Health Sciences) may be eligible for the Emogene Walmsley Fox Health Ed Scholarship or the Avril W. Burks Health Education Scholarship. Each program awards $500 per semester. There are also a number of graduate degree programs that are taught using a blend of online instruction and on-campus sessions, including MS in Family and Consumer Science, MS in Nursing, MA in Teaching, Doctor of Nursing Practice, and Education Specialist in Educational Leadership. The University of Arkansas at Monticello has a variety of online graduate degrees, most housed in the School of Education. Online programs in the education field include Master of Arts in Teaching, Master of Educational Leadership, and Master of Physical Education and Coaching. The MAT is for career changers who want to become classroom teachers in Arkansas. The Online Master of Education has tracks in special education, teacher leader, and content. The School of Music has a low-residency Master of Music in Jazz Studies that includes 18 credits in online coursework during the fall and spring semester with residencies required the summer before and after the student takes those online classes. Each summer session lasts for two weeks. Southern Arkansas University offers about a dozen online degree programs, mostly at the graduate level. For undergraduates, SAU offers a Bachelor of Business Administration program online. The program is primarily designed as a degree-completion program for students who have an associate degree or who have completed most of their general studies requirements. The university also has an online degree-completion program for registered nurses who want to achieve a Bachelor of Science in Nursing. Many of the online master's programs are in education, including a Master of Education (M.Ed.) in Higher, Adult, and Lifelong Education, M.Ed. in Curriculum and Instruction, M.Ed. in Library Media and Information Specialist, M.Ed. in School Counseling, M.Ed. in Student Affairs and College Counseling, M.Ed. in Educational Administration and Supervision, and Master of Arts in Teaching. SAU also has an online MBA, Master of Computer and Information Science, Master of Science in Kinesiology-Coaching, and Master of Science in Mental Health and Clinical Counseling. Online students have access to resources including electronic library resources, an employment resource center, and student support services. John Brown University offers three bachelor's degrees and four master's degrees online. Online bachelor's degrees are offered in business administration, liberal arts and management accounting. John Brown's online bachelor's program ranked 107th in U.S. News & World Report's 2015 list of the best online bachelor's programs. JBU's online bachelor's degrees are offered as degree completion programs, meaning students must have 60 transferable credits from another institution to be accepted into these programs. Online master's degrees at JBU include an MBA in Leadership and Ethics, an MBA in International Business, an M.S in Leadership and Ethics and an M.S. in Higher Education Leadership. Henderson State University has online programs leading to graduate degrees in education leadership, teacher education, family services, and business. Education leadership programs include a Master of Science in Education and principal licensure, Master of Science in Education in Educational Technology Leadership, Education Specialist in Curriculum Leadership, Education Specialist with licensure in district level leadership, and licensure as a curriculum program administrator. Teacher education programs include a Master of Science in Education in Special Education K-12 and a program leading to licensure as an instructional facilitator. A current teaching license is required for the education programs. The Master of Science in Developmental Therapy prepares candidates for certification as a development therapist working with infants and toddlers who have disabilities. The program is open to individuals who have an undergraduate degree in education, psychology, or a related degree in social services. Henderson State offers MBA classes online, but studnets might not be able to complete all the MBA requirements entirely online. Planning your online education in Arkansas can be a challenge! How do you find the program you want? Are there any tuition discounts or special programs for online learners? Which state universities are the most affordable? How do you know if a school in Arkansas is regionally accredited? Never fear, our guide to choosing an online program in Arkansas is here! We’ve put together a list of tips and resources that are designed to help you get the most bang for your buck. You’ll find info on course catalogs, distance education options, the Higher Learning Commission (HLC), and a whole lot more. We also profile Arkansas universities that meet our criteria for both online quality and affordability. Southern Regional Education Board (SREB) Electronic Campus has partnered with a number of southern schools—including universities and community colleges in Arkansas—to offer a great online program & course catalog. You can search for any degree program or a specific course! Programs that are marked “E” are offered at the Electronic Rate, which means the in-state and out-of-state tuition rates are the same. Participating Arkansas institutions in this catalog include Arkansas Tech University, Cossatot Community College, NorthWest Arkansas Community College, Southern Arkansas University Tech, Southern Arkansas University, University of Arkansas – Fayetteville, University of Arkansas – Little Rock, and the University of Central Arkansas. The SREB also runs the Academic Common Market-Electronic Campus (ACM-EC), a program that allows students to pursue out-of-state college degrees through distance education and only pay in-state tuition rates. These approved ACM-EC programs must be in one of the 15 participating SREB states. Also, you won’t be eligible for discount tuition rates if a public college or university in Arkansas already offers a degree program in your chosen field of study. To apply, you will need to meet the admissions requirements of the college or university that offers the program and be certified as a resident of Arkansas by an ACM coordinator. Visit the website for instructions. eVersity is a 100% online university that offers degrees composed of courses that are found at the fully-accredited universities in the University of Arkansas System. This is the 18th school in the UA System and was created to attract adult learners who have some college credit (but no degree) and students who might have been considering a for-profit institution. Students pay a fixed tuition cost per credit hour with no fees, and courses are developed and taught by UA System faculty. As an online university, eVersity is not approved to administer federal financial aid. However, all eVersity students are admitted to a concurrent degree program run by the University of Arkansas at Monticello (UAM), which is authorized to administered federal financial aid to eligible students. See the Financial Assistance page for more info on your options. Need a quality check on a program? The Arkansas Higher Education Coordinating Board (AHECB), run by the Arizona Department of Higher Education, is designed to protect Arkansas students from fraudulent or inferior certificates & degree programs. Every year, it issues an AHECB Approved List by Distance. These are online or hybrid programs offered by Arkansas universities & community colleges that have been reviewed and approved by the Board. These Arkansas schools appear on both our “Top Online” and “Most Affordable” lists. That means they meet our rigorous criteria for quality, flexibility, price, and use of financial aid money. (You’ll see a CAG Score next to their profiles in our ranking.) If you like the look of a few of them, you can compare their graduation rates and debt loads on College Scorecard. UA Online lists all its traditional online degree programs and self-paced courses, and provides info on financial options (check out the One Stop Student Guide). Students who study solely online only have to pay in-state tuition, regardless of their location. You can view a breakdown of estimated tuition costs on each online degree page; prospective undergraduates may qualify for the application fee waiver. If you’re looking at quality markers, UA often does very well in U.S. News & World rankings for its Online Programs, including a Top 20 spot for bachelor’s programs and a Top 50 spot for graduate engineering programs. That’s partly because UA is the only institution in Arkansas classified as having the highest research status by The Carnegie Foundation for the Advancement of Teaching. As the UA Online website points out, that means UA is among the top 2% of colleges and universities nationwide in this category. UCA Online has the scoop on programs and resources, and the tuition and fees calculator will allow you to estimate total costs for online and/or campus courses. Online students are eligible for financial aid. UCA also provides payment plans. UCA Online has a variety of programs at all levels. However, its completion degrees (e.g. BBA) are deliberately aimed at working adults and people who have earned at least 60 hours of college credit, or an associate’s degree, and wish to earn an affordable online bachelor’s degree. No matter which degree you’re thinking about, make sure your online university or college is fully accredited by an organization recognized by the U.S. Department of Education. Run away from any school that makes vague international accreditation claims. Although national accreditation applies to distance learning institutions, regional accreditation is the gold standard, especially if you’re thinking of transferring credits. The Higher Learning Commission (HLC), once known as the North Central Association of Colleges and Schools, is in charge of regional accreditation for Arkansas universities and community colleges. It’s easy to search for HLC-accredited institutions by state on the directory. You can read the “Public Disclosure Notice” to see if the school has been placed on notice, sanctioned, or put on probation. Or you can check for regional or national accreditation status using the Council for Higher Education Accreditation (CHEA) Database. Arkansas doesn’t have as many problems with degree mills that states like California or Alabama do, but it always pays to be on your guard! The CHEA Database states that Remington College is nationally accredited by the Accrediting Commission of Career Schools and Colleges (ACCSC), but it is not regionally accredited. Originally, Remington was for-profit, but in 2011 The New York Times reported that Remington College, a “Florida-based for-profit school, was sold to a nonprofit with the owners lending it $136 million for the sale.” This move came under strong criticism in The Century Foundation’s 2015 report, The Covert For-Profit. University of Phoenix is a for-profit institution headquartered in Arizona. The CHEA Database notes that it is regionally accredited by the Higher Learning Commission (HLC), but it has been subject to a number of lawsuits regarding recruitment practices. College Scorecard reports that the Little Rock campus has an extremely low graduation rate and a low number of students who return after the first year. Higher Learning Commission (HLC): You can check if your online Arkansas community college or university has regional accreditation by searching for HLC-accredited institutions by state. Virtual Arkansas: This resource is for public high school students who wish to supplement their education with quality online courses taught by Arkansas licensed instructors. It’s the result of a partnership between the Arkansas Department of Education (ADE) and the Arkansas Education Service Cooperatives (AESC). Students can enroll in these courses through their local school administration. Southern Regional Education Board (SREB) Electronic Campus: SREB allows you to search for online degree programs or courses being offered by participating Arkansas institutions. You’ll also find answers to FAQs (including info about transferring credits), a section on financial aid, and a list of online programs that qualify for in-state tuition benefits.